On-the Air: The King of Digital Contesting Is Here! + Get Ready for the February Issue of QST! Late last month, the ARRL filed a complaint with the FCC, documenting ongoing harmful interference and egregious rules violations by Broadband over Power Lines (BPL) systems installed by IBEC, Inc. in Virginia, Pennsylvania and Indiana. In its filing, the ARRL requested that the FCC "initiate immediately an enforcement proceeding regarding these BPL systems, and cause them to cease operation until such time as they are each in full compliance with the Commission's Rules." Contrary to earlier representations -- both to the ARRL and in statements in the online BPL database -- IBEC's systems in these locations are not universally notching the amateur bands as is necessary in order to avoid emissions at levels that are likely to cause harmful interference to licensed Amateur Radio stations. In fact, measurements by ARRL staff that were independently confirmed show that IBEC systems are not even notching the aeronautical bands. The FCC rules require BPL systems to avoid these bands, but IBEC is operating at power levels that cause radiation well in excess of the FCC limits. Read more here. The ARRL Audio News is once again available through iTunes, beginning today. You can find the URL for the Audio News' RSS feed here. To download and subscribe to the Audio News at iTunes, log into your iTunes account and go to the "Advanced" pull-down menu. Click on "Subscribe to Podcast," insert http://www.arrl.org/arrlletter/audio/aan.rss in the dialogue box and click "OK." You are now subscribed! If you had previously subscribed to the ARRL Audio News via iTunes, you should not have to re-do these steps; episodes should appear in your podcast folder once you sync your device. Step-by-step photo instructions are available here. Of course, the ARRL Audio News is also available on the ARRL Web site and via telephone at 860-594-0384. The ARRL Audio News is compiled, edited and produced in conjunction with each ARRL Letter (except during the Dayton Hamvention, Thanksgiving and other times as announced). Start 2011 with one of the most enjoyable contests on the calendar -- the ARRL RTTY Roundup, January 8 and 9. The goal is simple: make as many contacts -- and multipliers -- as possible! 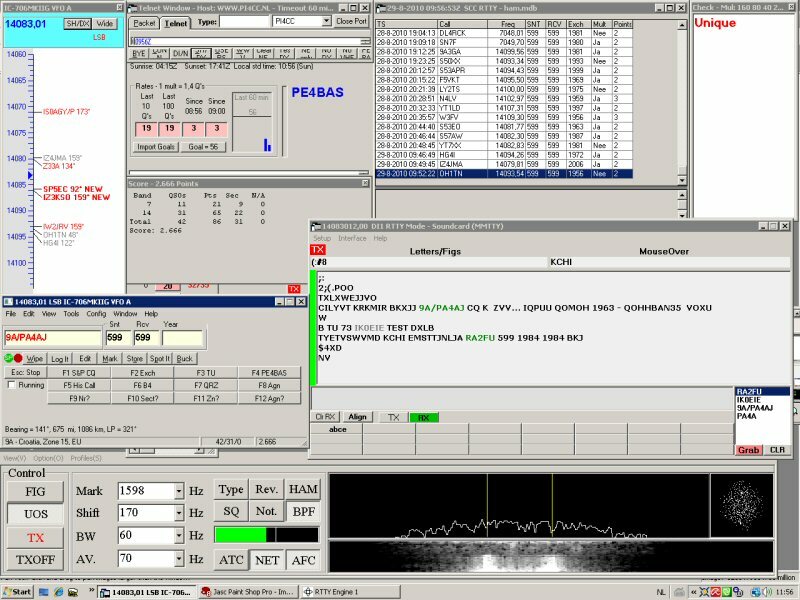 While any digital mode can be used in during the Roundup (including PSK31), radio teletype -- better known as RTTY -- is the undisputed king of this event. You won't need to shout into a microphone or master high-speed CW to participate. 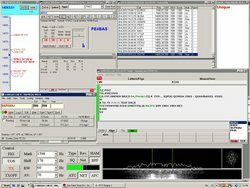 If you can type -- even slowly -- on a computer keyboard, you're more than qualified to try the RTTY Roundup. Read more here. 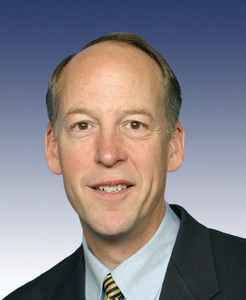 US Representative Greg Walden, W7EQI (R-OR), tweeted news of his appointment in Morse code. When US Representative Greg Walden, W7EQI (R-OR), learned December 16 that he would be chairing the House Subcommittee on Communications, Technology and the Internet when the 112th Congress convened in January, he let the world know about it by tweeting the news in Morse code. "Just the ham radio operator in me having fun," he posted to his official Web page. The subcommittee has jurisdiction over "interstate and foreign telecommunications including, but not limited to all telecommunication and information transmission by broadcast, radio, wire, microwave, satellite or other mode." ARRL Chief Executive Officer David Sumner, K1ZZ, was pleased to hear the news: "We're delighted that the subcommittee is in the hands of such a well-qualified chairman. Greg was an early cosponsor of HR2160, and while he may not always be able to agree with every ARRL position, we know his door will always be open to us." The February issue of QST is jam-packed with all sorts of things that today's Amateur Radio operator needs. From product reviews to experiments to contesting -- including a look at the upcoming launch of ARISSat-1-- this issue of QST has something for just about everyone. After years of planning, the next generation of satellites to be launched from the International Space Station is getting ready to be sent off into space. Go behind the scenes -- and discover how you, too, can get in on the fun -- as AMSAT and the Amateur Radio on the International Space Station (ARISS) program team up in "Get Ready for ARISSat-1." And if space is indeed the "final frontier," a Mid-Eastern desert is probably a close second. Join David Collingham, K3LP, and Paul Ewing, N6PSE, as they recount their DXpedition to Kurdistan in Northern Iraq in "YI9PSE Iraq 2010 -- An Extreme Venture." Lou Burke, W7JI, wanted to add a receiver on to the QRP transmitter project he had built. He wanted the receiver to be housed in the same enclosure and to work with the transmitter in a transceiver-like mode, but still have the ability to stand alone as a separate receiver. In his article "A Compact 40 Meter Receiver," Burke says that there is nothing like the feeling you get from making a QSO with a rig that you built yourself. Take a look at the Ten-Tec R4020 two band CW QRP transceiver, featured in the February 2011QST product review. Click here to go to the QST Multimedia page and scroll down to the Product Review video. Click the "Play" button to watch the video. ARRL Field and Regulatory Correspondent Chuck Skolaut, K0BOG, takes a look at the Ten-Tec R4020 two band CW QRP transceiver in this month's Product Review. He calls it a "transceiver with a variety of convenience features. It can operate from internal batteries, so add a paddle, headphones and antenna and head for your favorite trail location." QST Contributing Editor Phil Salas, AD5X, checks out the Mini-Circuits PWR-6GHS+ USB power sensor. He says that it is "a reasonably priced, highly accurate, very broad range power meter that is equally useful in a commercial lab or home experimenter's workshop." QST Technical Editor Joel Hallas, W1ZR, reviews the Array Solutions AS-43A digital upgrade kit for the Bird 43 wattmeter. He says this kit "provides a three digit digital readout for your tired old Bird wattmeter. While the accuracy is limited by the wattmeter slugs, a calibration adjustment is described that can improve accuracy." Of course, there are the usual columns you know and expect in the February QST: Happenings, Hints & Kinks, The Doctor Is IN, How's DX, Vintage Radio and more. Look for your February issue in your mailbox. QST is the official journal of ARRL, the national association for Amateur Radio. QST is just one of the many benefits of ARRL membership. To join or renew your ARRL membership, please see the ARRL Web page. This feature is a concise monthly update of some of the things ARRL is doing on behalf of its members. This installment -- which covers the month of December -- looks at the ARRL confronting the FCC over BPL matters, a possible new secondary MF allocation, reports from the Official Observer Desk and more. Read more here. In October 2010, an agent from the FCC's Enforcement Office visited Monroe, Michigan-based Doctor Radio's CB Shop to find that the store was selling, among other items, a radio that was described as "an Amateur Radio that could operate on CB frequencies" that was modified to operate above the approved power limits. 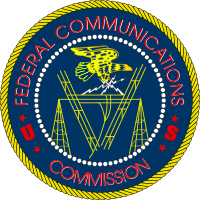 As such, the FCC issued a Citation to the store on January 4 for marketing unauthorized radio frequency devices in the United States in violation of Section 302(b) of the Communications Act and Section 2.803(a)(1) of the Commission's rules. Read more here. When General Motors -- the world's second largest auto maker -- encountered a problem with the AM/FM antenna on its 2011 Chevrolet Camaro convertible, it was at a loss as to what to do. Spy photographs showed a pre-production version of the car with a long whip-style antenna on its rear fender. After what GM called "an outcry among Camaro enthusiasts," the company decided to rethink the antenna. But how? On hardtop Camaros, the antenna is integrated into the rear windshield, but given the disappearing nature of this car's roof, that wasn't possible on the convertible. So GM turned to two antenna engineers -- Don Hibbard, W8DBH, and Gregg Kittinger -- who were tasked with doing what some thought was impossible: concealing the AM/FM antenna without sacrificing radio reception, while not putting it inside the Camaro's windows. Read more here. The Yasme Excellence Awards are given to individuals who through their own service, creativity, effort and dedication, have made a significant contribution to Amateur Radio. Their contribution may be in recognition of technical, operating or organizational achievement. The Yasme Foundation has recognized the following individuals "in order to inspire them and others on behalf of Amateur Radio now and in the future." Read more here. David Drummond, W4MD, of Northport, Alabama has been appointed Alabama Section Manager effective January 1, 2011. In December, Jay Isbell, KA4KUN, -- who had served as Section Manager since January 2008 -- resigned due to health related reasons. ARRL Membership and Volunteer Programs Manager Dave Patton, NN1N, made the appointment in consultation with Southeastern Division Director Greg Sarratt, W4OZK. Drummond has served as Alabama Assistant Section Manager since January 2008. He will complete the current Section Manager term that continues through December 31, 2011. 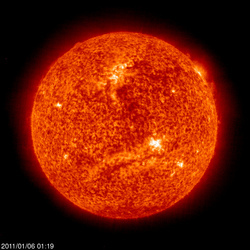 The Sun, as seen on Thursday, January 6, 2011 from NASA's SOHO Extreme Ultraviolet Imaging Telescope. This image was taken at 304 Angstrom; the bright material is at 60,000 to 80,000 Kelvin. Tad "Shining snow crystals rainbowed by the Sun" Cook, K7RA, reports: The average daily sunspot numbers were up nearly 24 points this week to 50, while the average daily solar flux rose more than 9 points to 89.5. The lagging three month average of daily sunspot numbers was down 3.5 points from last month's average of the previous three months. The three month moving average of daily sunspot numbers --ending on June through December -- was 16.2, 20.4, 23.2, 28.9, 33, 35.6 and 32.1. The latest forecast from NOAA/USAF for the next 10 days has a solar flux of 88 on January 6-7, 86 on January 8-9, 84 on January 10, 82 on January 11 and 80 on January 12-15. Planetary A index is predicted at 7 on January 6-7, 10 on January 8-10, 7 on January 11 and 5 on January 12-15. There is a chance of a stiff solar wind and geomagnetic storms on January 7-8. Yekta Gursel, KJ6DRO, alerted us to an article in the February 2011 issue of Sky & Telescope titled "The Perfect Solar Superstorm." You can read most of it here; click on "Preview" if you are not a subscriber. Your local library may also provide online access to the magazine. The article begins on page 28. Look for more information on the ARRL Web site on Friday, January 7. For more information concerning radio propagation, visit the ARRL Technical Information Service Propagation page. This week's "Tad Cookism" is brought to you by Amy Lowell's A Winter Ride. The winner of the QST Cover Plaque Award for December is Eric Nichols, KL7AJ, for his article "Gimme an X, Gimme an O. What's that Spell? -- Radio." Congratulations Eric! The QST Cover Plaque award -- given to the author or authors of the best article in each issue -- is determined by a vote of ARRL members on the QST Cover Plaque Poll Web page. Cast a ballot for your favorite article in the January issue today. A. George Spencer, VE3AGS, passed away December 21, 2010. He was 90. Spencer served as ARRL Canadian Division Vice Director from January 1970-January 1974. In 1974 -- upon the election of Canadian Director Noel Eaton, VE3CJ, as ARRL Vice President -- Spencer moved up to the Director position and served one term. An engineer by training and profession, Spencer lived all across Canada. While on the ARRL Board of Directors, he was VE2MS and then VE4IM; he later became VE6AW before moving to Ontario and obtaining his initials. Leonard Andrew "Woody" Woodward, W7KOP, of Mapleton, Utah, passed away December 25, 2010. He was 99. Woodward -- who, according to the Boy Scouts of America, was the "longest continuously registered Scouter" -- was involved with scouting for more than 87 years. BSA's Utah National Parks Council Program Director John Gailey called Woodward "an amazing man" and told the ARRL that his friend was still "very much active on the air weeks before his death." At the age of 8 in 1918, Woodward built his own radio. At the time of his death, he was using the Internet to connect Amateur Radio operators around the world. 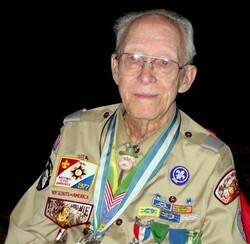 Woodward was known all over the world as an unofficial ambassador of America and Scouting through his radio contacts. Read more here.